Last night I installed Ubuntu 18.04 Bionic Beaver Linux on my desktop PC by completely whipping out Windows 7 OS. So after proper Linux installation the first problem I faced was low resolution display which was totally annoying me given that I have a NVIDIA Geforce GTX 750 TI graphics card installed in the machine. My monitor’s resolution is 1368×768 but Ubuntu defaulted it to 960×540. So I searched over Google and found some solutions and started applying all until I got my result. Now I’m writing all the methods that worked for me to fix this problem. I assume that you’ve updated the system after OS installation. If not then write this commands in the terminal. Use CTRL + ALT + T to open Ubuntu Terminal. So the above output say that I’ve NVIDIA Geforce GTX 750 Ti graphic card installed and the recommended drive to install is nvidia-390 . After completing the installation, reboot system. Ps. This above method didn’t work for me. But I put it here thinking that it may work for someone else judging by it’s the easiest way out there.But I did everything manually. All the steps are mentioned below. And you’ll see your Nvidia driver in the terminal. These commands will require your system password. Then you need to update the kernel initramfs. BINGO!!! The Nvidia driver is now installed. Reboot your system. 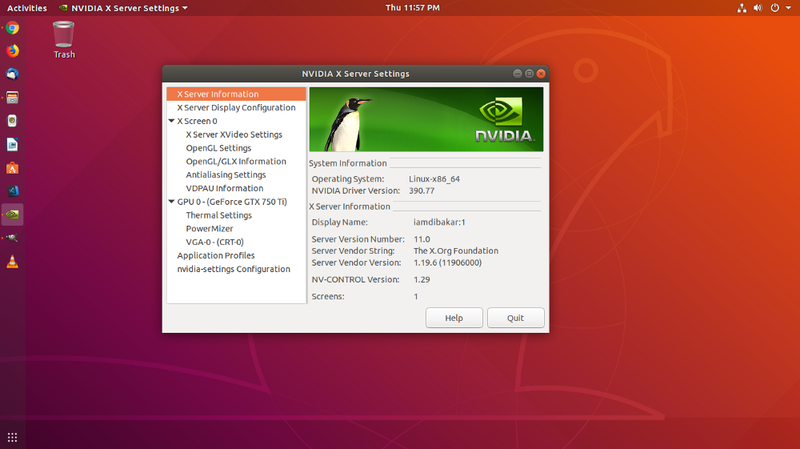 After reboot you should be able to start NVIDIA X Server Settings app from the Activities menu. Now from that app you’ll be able to change your display resolution. I hope this fixed your problem too. I think this is a bit out of touch-could you explain better?